Being Frugal and Making It Work: Save $15 Instantly at OfficeMax when you buy $300 in Visa Gift Cards + $50 Amazon Gift Card Giveaway! Save $15 Instantly at OfficeMax when you buy $300 in Visa Gift Cards + $50 Amazon Gift Card Giveaway! I'm a frugal mom, shopper, and blogger that makes a point to save as much money as I can whenever I make any purchases. I shop clearance and sales, use coupons whenever I can, and watch for special product promotions to maximize my savings. You'd be amazed at how much you can save with very little effort. Now through August 29th, you can save $15 instantly at OfficeMax when you purchase $300 in Visa gift cards. You might be asking yourself, "Why do I need $300 worth of Visa gift cards?" Well, let me tell you why you might need them. Visa gift cards can be used anywhere that Visa is accepted! Visa gift cards make the perfect gift for anyone and any occasion! Unlike gift certificates, they never expire! The great thing about VISA gift cards is that they can be used anywhere that Visa is accepted! You aren't limited to one specific business. Grocery stores, movie theaters, clothing stores, gas stations... making them the perfect gift! You can use them to save on your back-to-school shopping, give them as the perfect birthday, graduation, wedding, or holiday gifts, or simply use them instead of carrying cash! If you are a Chase Ink Business credit card customer, you can double dip on savings! That's right! These cards offers increase rewards on purchases made at office supply stores, so customers can earn an additional 4x points of 5% cash back on your Visa gift card purchase. How would you like to WIN a $50 Amazon e-gift card? Whether you decide to use it now or save it to do a little Christmas shopping... you're not going to want to miss out on this great giveaway! 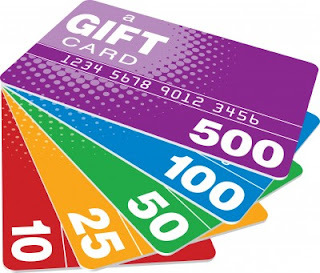 What is your favorite gift card to give or receive? Visa gift cards make awesome gifts. I usually get them for my boys for their birthdays so they can pick out what they want.